Trupialis loyca Bonaparte, 1851, Peru. At present, four geographically discrete forms are recognized. French: Sturnelle australe; German: Langschwanz-Soldaten-starling; Spanish: Loica Común. 9.5-10 in (24-25.5 cm); 4 oz (113 g). The sexes are similar in color, but the females are somewhat duller. The throat, breast, and belly are red, and there is a dash of red from above the eye to the bill. There is a white line running from the top of the eye back to the nape. 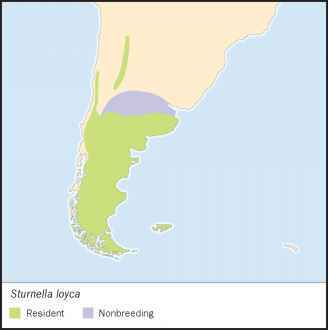 Resident in western South America from central Chile and in foothills and intermontane valleys in western Argentina, and in the steppes of central Argentina south to Tierra del Fuego and the Falkland Islands. Some Chilean and Patagonian birds move northward in winter. Arid grassy areas with scattered shrubs; pastures and cultivated fields. Territorial during the breeding season. Males defend a territory with songs and chasing; they generally sing from bushes or trees. Long-tailed meadowlarks typically perch in trees in flocks and behave more like many other blackbirds rather than other meadowlarks, which characteristically spend most of their time on the ground. In winter, solitary or found in small groups. Forage on ground where they take seeds and insects. Monogamous. Nest is a domed cup placed on the ground (except in the Falkland Islands where the nest may be above the ground, built on a pedestal of tussock grass). Generally 3-5 eggs are laid in September-January (August-November in Falklands). Data on incubation and fledging not available. May be double brooded. Not threatened. 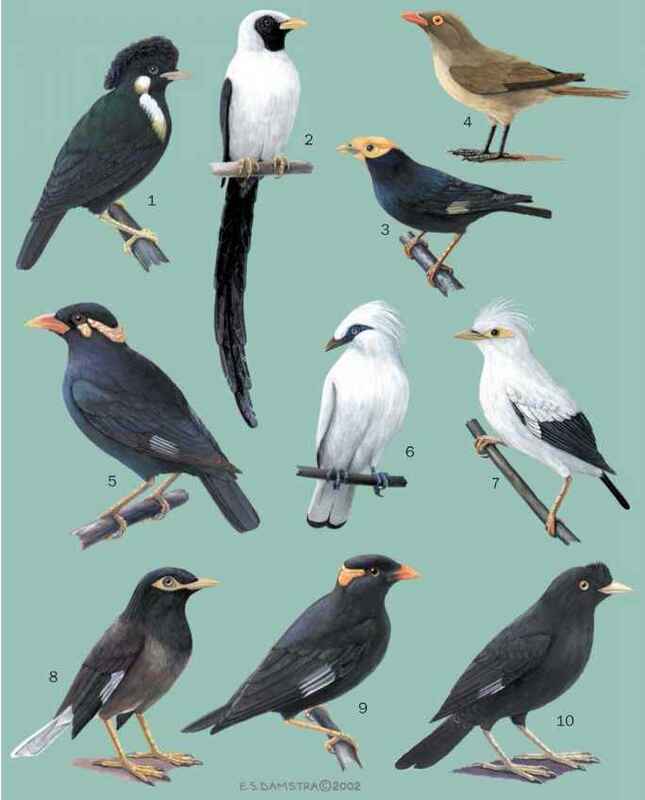 Common throughout their range.